Perched high up on a hill with 360 views overlooking rolling hills is a beautiful custom luxury home surrounded by 70.99 acres with a stocked pond. As you enter this gracious home you are welcomed by a sweeping staircase and incredible two story sunken great room with wall of paneled custom built-ins with TV and a wall of windows and French doors which lead out to the magical back yard and pool area, custom paneling with built-in tv and magnificent fireplace. The entryway is flanked by a dining room and cozy living room. The gourmet kitchen, which overlooks the great room, has custom European cabinetry with accent lighting, high-end appliances: subzero Refrigerator, built-in cook top, built in double ovens. An over-sized L-shaped work space and additional island provide the gourmet chef plenty of space to prepare fabulous meals. Off of the kitchen is a beautiful octagon shaped sun room with floor to ceiling windows and views of the tranquil landscape. The laundry room, also off the kitchen, contains an elevator shaft studded from the basement all the way up to the master suite! On the first floor is also a first floor en-suite which could be your first floor master or wonderful guest suite. The upstairs is where you will find the incredible master bedroom ensuite with sitting area, sumptuous master bath and wonderful walk-in closets! French doors lead you out to your fabulous French doors lead you out to a large octagon balcony so you can enjoy panoramic views of your own spectacular property. The two other bedrooms are adjoined by a bathroom and one of the bedrooms has a Juliet balcony with the most incredible custom wrought iron railing which is a true masterpiece. The luxury continues when you walk outside to your patio with custom in-ground gunite pool with spa/hot tub, as you enjoy days basking in the sun or quiet evenings enjoying the lovely gardens and views for miles! 45 minutes from Philadelphia, 30 mins from Wilmington, just over an hour to the jersey shore and Atlantic City! 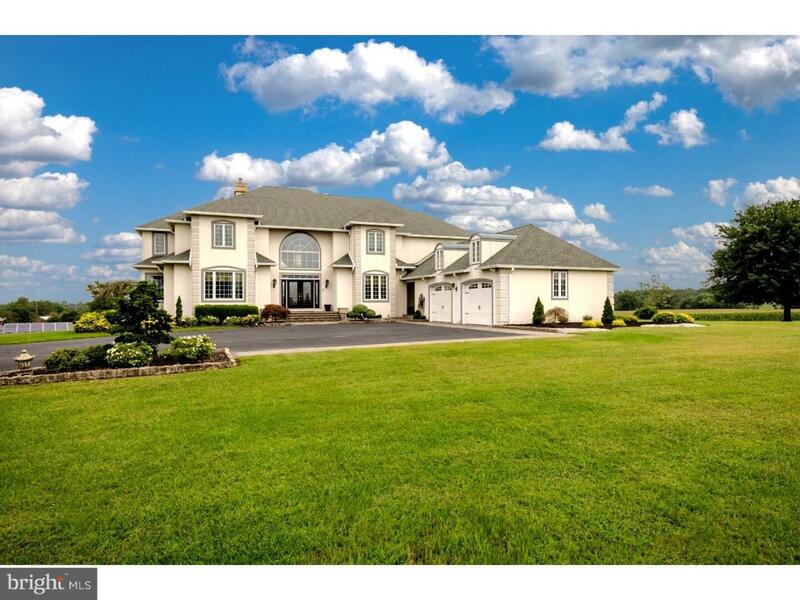 10 mins from exit 2 of the NJ Tpk, 4 wineries all w/in 10 miles, cowtown rodeo is an easy 5 minute drive, antique shopping, across the street from a Town and Country golf course, & this luxury property is surrounded by numerous local farmers markets and riding stables for the true, or aspiring, equestrian! And lastly, the finished walk-out lower level with built in bar provides another 2,100 sq ft of additional space. Please Note: this land has NOT been subdivided. The TOTAL acres is 71.99 ($1,495,000) but seller is willing to subdivide the property (house and some acreage) but not further. House and approx 12 acres are $895,000. Green Remarks Solar Panels Are Leased And Lease is $370 Per Month For 15 Years And Then A Buyer Would Own The Panels And The Electricity Would Be Free.